GOING GREEN! : The Dodgers play their last split-squad games in Cactus League play today, taking on the Brewers in Glendale and the Diamondbacks in Talking Stick. It will be Los Angeles’ first matchup against Arizona this spring (with a rematch tomorrow) after going 6-12 against the Snakes last year and the club’s second and final Cactus League contest against the Brew Crew after losing, 3-2, on March 11 in Maryvale. In honor of St. Patrick’s Day, the Dodgers will wear green jerseys and caps at home against the Brewers and green caps for their road game against the D-backs at Talking Stick. 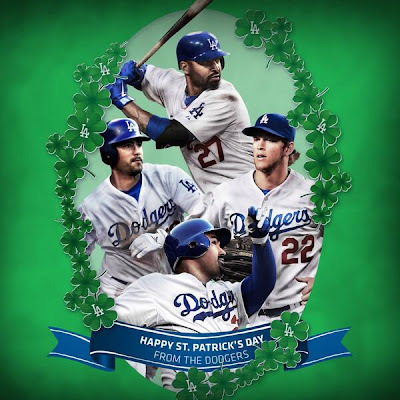 According to Stats LLC, there have been five Irish-born Dodgers in club history: Jimmy Archer (1918), Patsy Donovan (1890-1907), Jack Doyle (1903-1904), Mike Hines (1885) and Con Lucid (1894-1895). DEBUT IN DODGER GREEN: Carl Crawford is set to make his Dodger debut today, batting leadoff as the designated hitter against the Brewers. Crawford, who was obtained from Boston on Aug. 25, 2012 in the Los Angeles-record nine-player swap, last suited up in a Major League game on Aug. 19, 2012 and has been recovering from Aug. 23 Tommy John surgery. The 31-year-old has a .292 career batting average in 11 big league seasons and leads all active players with 114 triples, while ranking third with 432 stolen bases. BLANKED: The Dodgers were held to just two hits as they were shut out, 4-0, yesterday against the Rangers in Surprise. Brandon League, who was celebrating his 30th birthday, took the loss, allowing all four Ranger runs on four hits in the seventh inning. Clayton Kershaw made his fifth start of the spring and allowed just two hits, while striking out six, in 6.0 scoreless innings. After allowing nine runs (eight earned) in 8.0 innings in his first three starts, Kershaw has not allowed an earned run (one unearned) in his last two Cactus League starts (11.0 IP). Kershaw will be on the mound when the Dodgers open the 2013 regular season on April 1 against the Giants, which is just 15 days away! LEADERBOARD: The Dodgers rank second among National League clubs with both a .281 team batting average and a .348 on-base percentage. Los Angeles leads the league with 27 steals in 37 attempts this spring. Yasiel Puig ranks second among NL players with a .450 batting average, is third with 18 hits, places sixth with a .675 slugging percentage and is tied for third with 11 runs scored. Dee Gordon leads the NL with six steals and is tied for fifth on the circuit with seven walks. INTERNATIONAL FLAVOR: The Dodger organization is tied with the Blue Jays for the most players remaining in the World Baseball Classic with five; minor league RHP Angel Castro (Dominican Republic), SS Hanley Ramirez (Dominican Republic), RHP Kenley Jansen (Kingdom of the Netherlands), minor league RHP Andres Santiago (Puerto Rico) and minor league RHP Mario Santiago (Puerto Rico). Japan takes on Puerto Rico in the first semifinal tonight before the Dominican Republic meets the Netherlands tomorrow. The winners will meet in Tuesday’s tournament final. START ME UP: In Glendale, Hyun-Jin Ryu will face the Brewers for the second consecutive start after taking the loss on Monday at Maryvale, allowing three runs on five hits in 4.2 innings. Ryu, who will turn 26 on March 25, has 12 strikeouts in 10.2 spring innings in his four appearances (three starts). In Scottsdale, LHP Ted Lilly will make just his third Cactus League start after allowing five runs (one earned) on Tuesday against the Reds in Goodyear. Lilly has held the D-backs to a .230 batting during the course of his career, but has just a 5-8 record with a 4.88 ERA in 15 career games (13 starts) against Arizona. A D.R. IN THE HOUSE: The Dodgers have been active in the international free agent market in the past year and yesterday signed a trio of Dominican amateurs; shortstop Dennis Santana from San Pedro de Macoris, shortstop Carlos Aquino from Santiago and left-handed pitcher Cesar Romero from Santo Domingo. VERO MEMORIES: On this day in 2008, the Dodgers played their final game at Holman Stadium in Vero Beach, Florida, a 12-10 loss to Houston. Vero Beach hosted Dodger Spring Training for 61 years. FUTURE DODGERS: Registration is now available for the 2013 Dodgers Youth Baseball Camp, benefiting the Los Angeles Dodgers Foundation, which will be held June 25-28 (Session 1) and August 9, 12-14 (Session 2) at Dodger Stadium. Register your child today at www.dodgers.com/camp. The camp will feature instruction by Dodger coaches and alumni with special visits by current Dodger players. Enrollment is open to boys and girls, ages 7-12. TUNE IN: Matt Kemp and Andre Ethier’s voices will be featured in tonight’s episode of The Cleveland Show tonight at 8:30 pm on FOX as they guest-voice as themselves. In the episode, Cleveland pursues his dream of becoming a Major League Baseball scout. Here are this Sunday's Dodgers videos below. Dodger Stadium is looking fairly close to done. I wonder how progress is going on the inside. Video via Robert Murillo on youtube. Watch Clayton Kershaw be a pitch man for the MLB 2K13 Perfect Game Challenge. Oh-Oh, Troy's back. 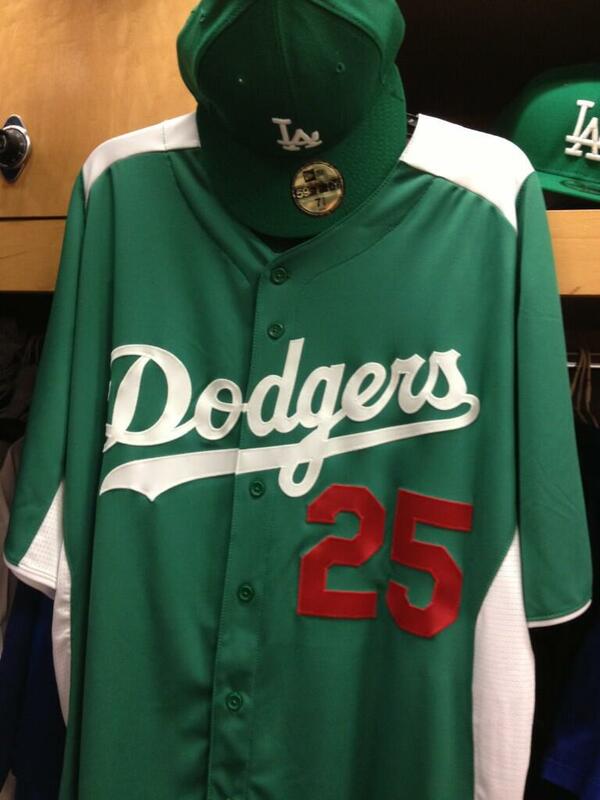 Here's his 2013 version of We Are the LA Dodgers. If you haven't seen this yet, here's the KCAL 'A Whole New Blue' commercial with Matt Kemp and Flip during Batting Practice.